For my daughter's party she has been doing mostly everything--she is so independent and knows just how she wants things to be. We bought some decorations, favors, etc. earlier last week but I'm busy cleaning (or trying to clean the house--very difficult with two toddlers). I bought stuff for the group gift--diaper bag that is packed with diapers, wipes, baby needs, baby socks that look like shoes, and teething toys. I also bought a whole bunch of matching girl clothes with the group gift money. I figure with two little ones, plus the three she already has, trying to get out and buy stuff with a gift card would be difficult (to say the least!). and all I have left is to finish the edging... This second picture was taken at night and my phone does not show pink very well. Then I had bought the Costco two pack of Johnson and Johnson baby shampoo/body wash and I thought I should get her towels but it seemed like towels were so expensive. 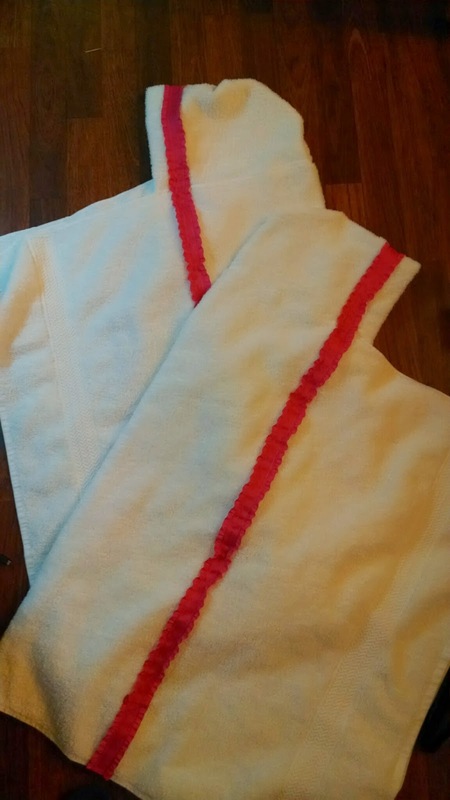 Sooo, I decided to search the web and sew up some hooded towels. I got a basic design from Not Just a Housewife but I did it a little differently. 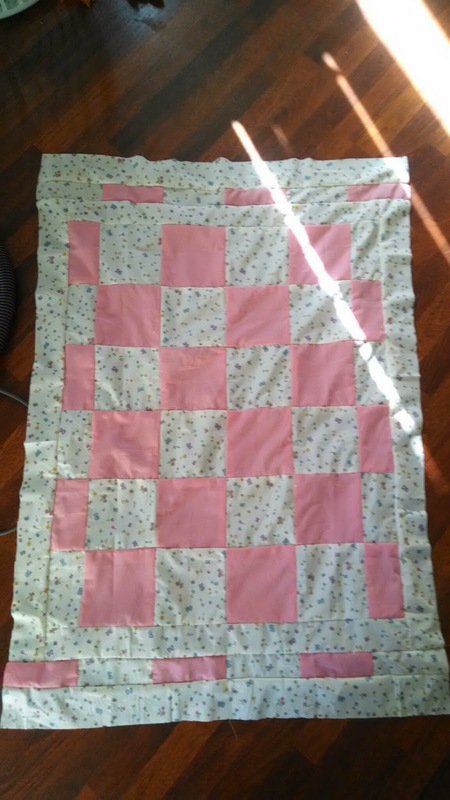 I didn't do the center pleat at all. I sewed the hood onto the towel and then put my embelishment around the hood all the way down the towel on each side...Here's the pic! Then I made bingo cards for when she opens up presents (found that idea on babycenter). I have some other games and one activity--a twin girl name activity. Everyone writes a girl name on the paper and then they pass is to the right. The second person puts a girl name that would be a good name for a twin. The papers get passed again and the third person now writes the last name written and a matching twin name. Keeps going... The fourth person writes the last name written plus a matching name. Well, I am exhausted. I still have a bunch to do tomorrow and the following day (but it should be a lot of fun)!